This shop has been compensated by Collective Bias, Inc. and its advertiser. All opinions are mine alone. #GoodyStyle #CollectiveBias Since my daughter has been born, I’ve been sticking ostentatious bows and headbands on her head. It was working out really well until she learned how to pull them off. Now that she’s three-years-old she has beautiful long hair, and she refuses to have it brushed with anything besides our bright pink (because pink is her favorite) Goody Ouchless Girls Oval Brush. This brush works really well on matted and messy hair, so I’m able to gently brushes out my daughter’s toughest tangles without the tears. I found it at Target and we both love it. She’s also completely over the headband thing, and with the starting school in the fall I need to step up my game and come up with some hairstyles that are quick and long lasting. I thought I’d play around with a few hairstyles and since her hair is finally long enough. 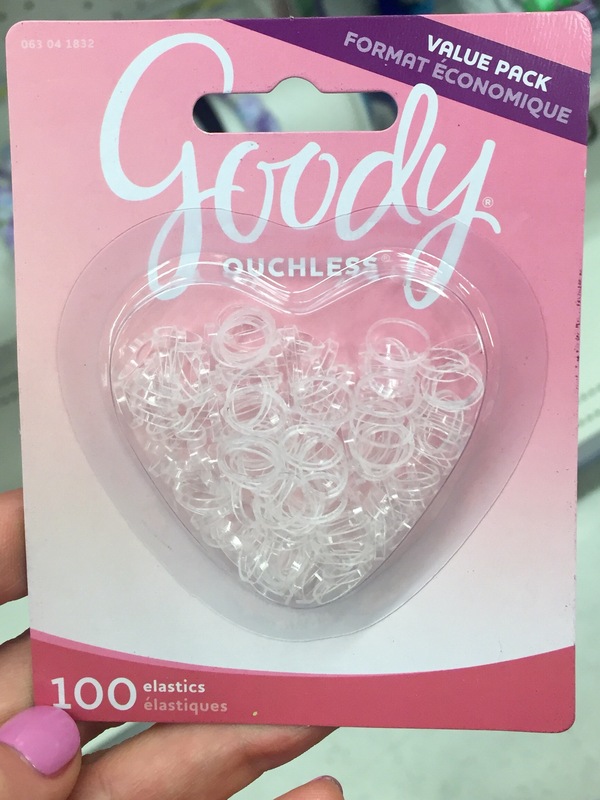 I personally love and have used the Goody Ouchless Elastics for years. But since my daughter still has baby soft hair, the Goody Ouchless Clear Elastics are perfect. They are secure and comfortable, and won’t pull or snag your hair when you take them out. I actually store mine in a small container with a clear lid and I never have to worry about them spilling out of the package. Begin with clean, brushed hair. Braid the hair into a simple braid and hold in place at the desired length. Secure with a Goody Ouchless Clear Elastic and begin loosening the braid by pulling on the individual sections. Continue pulling on each side and loosening until you reach the desired look. Add a bow to the bottom or ribbon. to finish. Section off the top half of the hair and create a messy bun on the top of the head. Add a big bow underneath the messy bun for a very quick yet polished look. To take the above messy bun to a mohawk, instead of adding the bow continue making two more messy buns down the back of the head. Secure with Goody Ouchless Clear Elastics. The end result should look like this, a fashion forward mohawk. These hairstyles turned out so cute! I’m totally going to have her rock this messy bun mohawk for Easter Sunday. 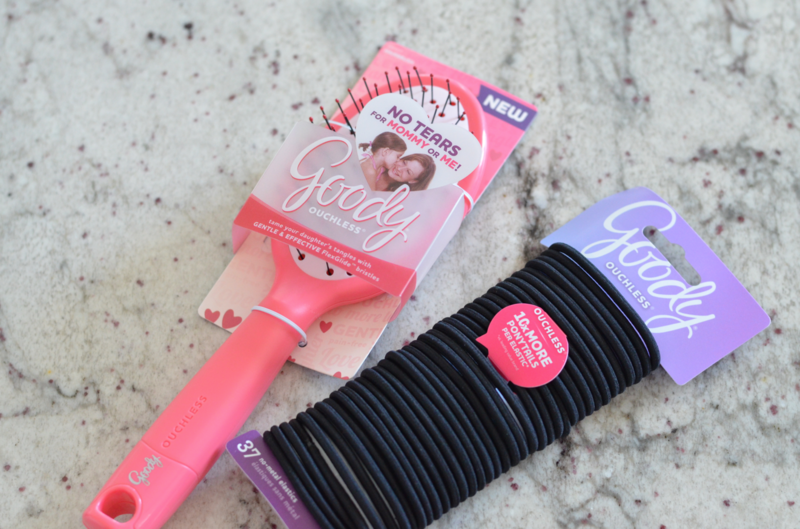 You can find the Goody Ouchless Girls Oval Brush and Goody Ouchless Elastics in the haircare aisle at Target, so you can easily recreate these looks at home! Also you can save 20% off any Goody hairbrush between 3/13-19 using the Cartwheel app the next time you’re at Target. But keep on the lookout for continuous CartWheel offers to save on your favorite Goody products. What are your favorite hairstyles to do on your busy toddler?